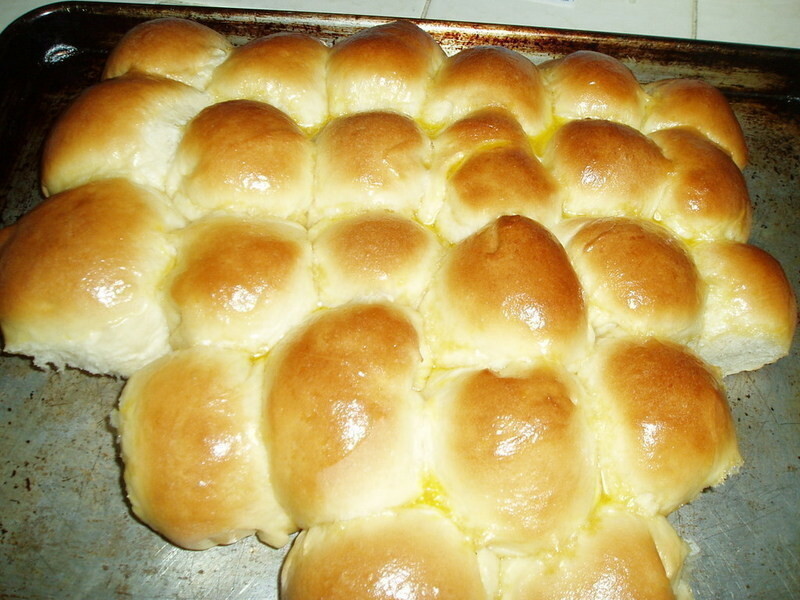 These are a slightly sweet dinner roll, really similar to kings hawaiian rolls, but a better texture because they are baked fresh. These are my sons hands down favorite roll . He likes me to make them bigger so he can have them for ham sandwiches too. In bread machine pan put water, then salt, the cake mix and flour top with the yeast and put it on the dough cycle. When cycle is complete remove from bread machine, I don't flour my rolling board I oil it so do what you prefer and cut and then roll into 15 to 20 rolls, put on a greased baking sheet cover and let rise till double about an hour. Bake at 400 10 to 15 minutes. You can also do this w/o a bread machine I am just lazy. I had a pretty pan full buut when I went to answer the phone my son and his friends raided my kitchen. God save me from hungry teenage boys! thanks mars f sounds simple enough! i think i'll try this for my next bread project. sugaree, you would mix the dough, this is a stickier dough then most then let it rise for about an hour or until double, then punch it down make it into rolls and let the rolls rise about an hour then bake. i am very new to bread making, but i imagine i would just mix the ingredients, knead the dough, then makes rolls and bake for the same amount of time? Thanks for the recipe. I love anything I can use my bread machine for. And I love those Hawaiian rolls. Can't wait to try it! Looks good! I'll have to give it a try. Thanks for the recipe!